This record-breaking Manchester City side is renowned for its attacking quality but defensively they have been much improved this season thanks largely to the acquisition of Ederson. Kevin De Bruyne and David Silva might be embroiled in a straight shoot-out to win individual awards at the season’s end but there is an argument to be made that the Brazilian shot-stopper is, in fact, City’s most important player. Ederson has adapted remarkably quickly to the Premier League following his summer move from Benfica, particularly after suffering a head-shuddering collision with Sadio Mane’s right boot early on in his City career. Besides making miraculous saves and offering a dominating presence in the penalty area, Ederson also sets in motion some of City’s lightning quick counter-attacks through his distribution. YouTube clips of Ederson’s passes have been doing the rounds on Twitter and it isn’t hard to see why. Few goalkeepers can match him when it comes to playing out from the back. Pep Guardiola’s No.1 (or 31 on the back of his shirt) is the epitome of the modern day ‘sweeper keeper’ but which other shot-stoppers could follow in his footsteps? 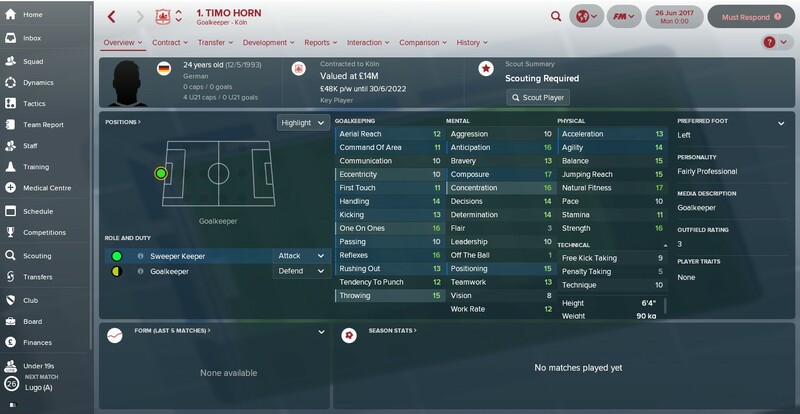 We used FM18 to do a bit of scouting. If the cards had fallen differently, it might be Geronimo Rulli guarding City’s goal rather than Ederson. There’s no reason to believe that City’s interest in Rulli was anything other than genuine. He was one of the standout goalkeepers in La Liga after all and has continued to be since re-joining the club on a permanent basis. In recent Football Managers, Rulli has been a must-have goalkeeper and he remains so on FM18. The 25-year-old possesses cat-like reflexes and strong kicking (15) and passing (13) skills and is pretty obtainable too. Rulli is slightly older than Ederson but at 25 is a spring chicken in goalkeeper terms. German goalkeepers are all the rage at the moment. 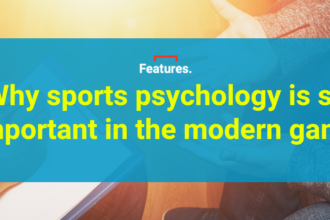 To some, Manuel Neuer reinvented the position while Marc Andre ter-Stegen is rapidly becoming one of the world’s best goalkeepers. Both Neuer and Ter-Stegen are already in the world-class category or almost there in the latter’s case and perhaps the next big goalkeeper to hail from Germany is Timo Horn. Horn has represented Die Mannschaft from every age group up until senior level and kept goal during Germany’s silver-medal winning Olympics campaign in Brazil last year. He is an extremely well-rounded goalkeeper on FM18 possessing excellent technical and mental stats, while he has a minimum fee release clause of just £15.5m at the start of the game. Snap him up before someone else (usually Dortmund) does. Andre Onana spent five formative years at Barcelona before moving to Amsterdam in 2015 and consequently, he has been schooled in the same manner as Victor Valdes, Claudio Bravo and now, Ter-Stegen. 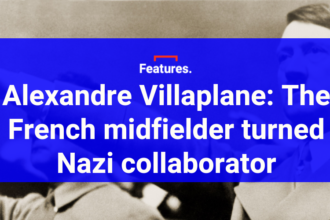 Ajax, who like Barcelona owe so much of their philosophy to the late, great Johan Cruyff, have long encouraged goalkeepers to play expansively and in that sense, Onana has had a perfect education for modern goalkeeping. Key attributes for Sweeper Keepers on FM18 are kicking and passing which are two areas in which Onana has plenty of promise (13 attributes for both at the start of the game). He is also quick off his line, a calming presence at the back and plays for a club who are ripe for picking on FM18. A work in progress, sure, but Onana has the qualities to go the very top. Brazil is a haven of up-and-coming footballing talent right now (as we discussed here) and another Samba star to keep tabs on is Atletico Mineiro’s 19-year-old goalkeeper Cleiton. 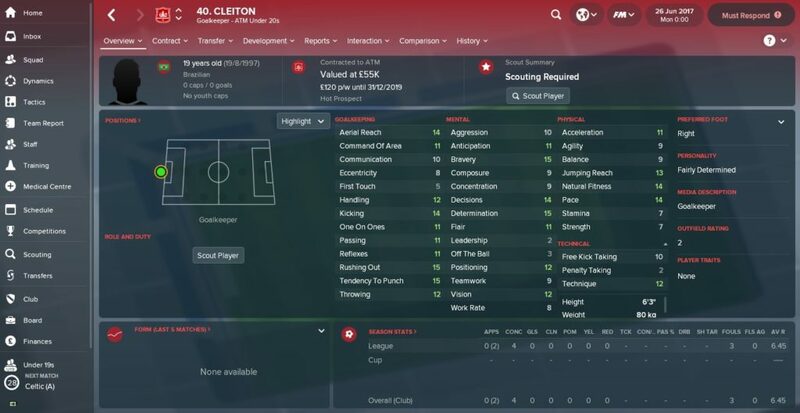 At the start of the game, Cleiton is usually just beginning to make his mark in Atletico’s first-team and while his stats don’t particularly jump out, he has serious potential. Cleiton has plenty of tools to make a great sweeper keeper with promising stats for kicking (14), rushing out (15) and throwing (12) although his passing (11) could do with a bit of work. Furthermore, he possesses Ederson-like bravery too with a 15 rating. You get the impression he wouldn’t be too affected by a boot to the face either. Despite a lack of Champions League clean sheets, Igor Akinfeev has been Russia’s goalkeeper for what has seemed like an eternity but eventually, he will have to pass the baton on. 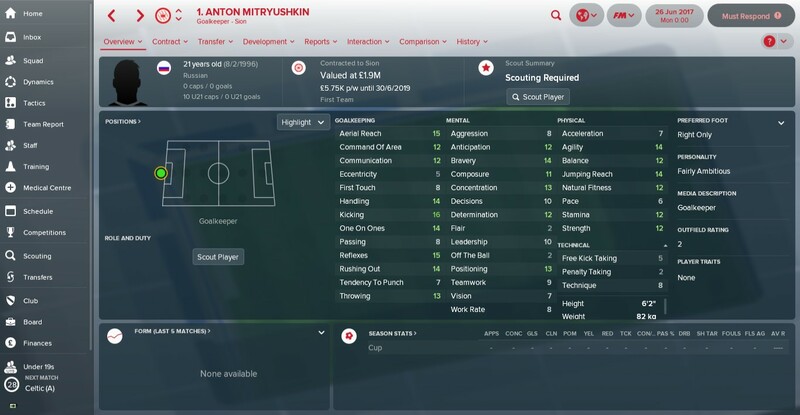 One of the front-runners to take his place in the long-term is Antonin Mitryushkin who since last year has plied his trade in Switzerland with FC Sion. Mitryushkin won the Golden Player award at the UEFA European Under-17 Championships in 2013 (which Russia won) and has been first-choice for their U21s for the past three years. 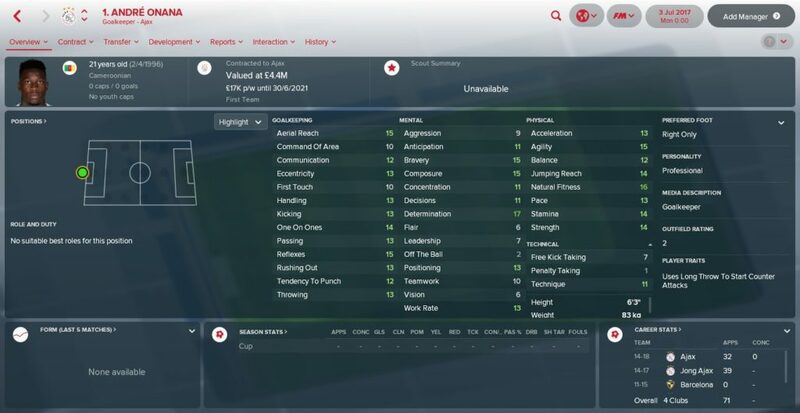 His kicking attribute (16) on FM18 may not be at Ederson levels (which stand at 20/20) but are impressive nonetheless while he also has excellent reactions and good throwing ability. Next articleWhere were the current Premier League bosses in CM97/98?